My husband pointed out this plum covered tree on a recent dog-walk. I know this may sound ridiculous but I’ve always felt there is something so magical about a fruit covered tree. They look like decorations. These are pretty plum colored Christmas ornaments, only better, because you can eat them! Growing up there was a small plum orchard in a ravine on the mountain behind our home. We helped ourselves to many a juicy plum. As did the bears. How did we know? They left evidence behind, on the ground. We had to be careful where we stepped while we picked the plums. Luckily we never came face to face with a bear, although as a kid I remember wanting to. 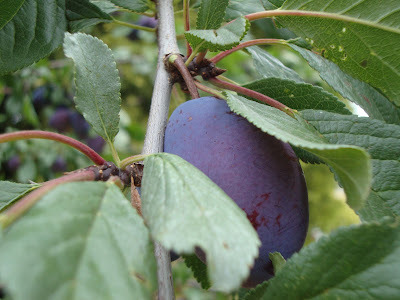 I LOVE my plum tree! I devoured every single plum a few months ago, before the birds could get to them. Delicious post. I get reddish plums at the market, but we don't see such purple plum-colored plums. Glad you never met a bear. I find plums (in the supermarket) frustrating. A good plum is really, really good, but I find one good one for about every eight tries. They're worse than pears. They look so juicy, and pretty. I love the colour and the matt surface. 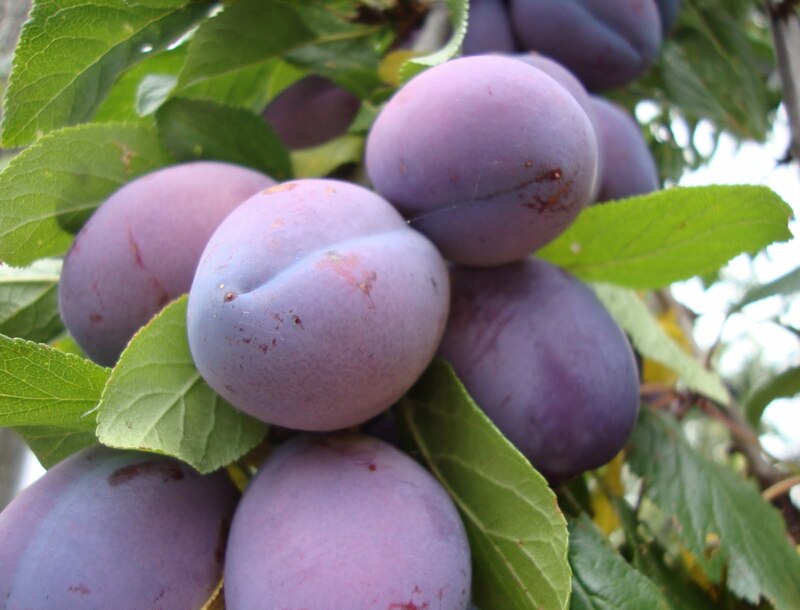 I love prune plums. We had raccoons that ate the plums at our last house. They would often take just one bite, then drop them on the ground where the ants would take over. So wasteful. But no bears in Overlook neighborhood! I just used the last of the frozen plums from last year. How's that for timing? Ours were not such things of beauty, but still delicious. They really do look like Christmas ornaments with that lovely bloom. 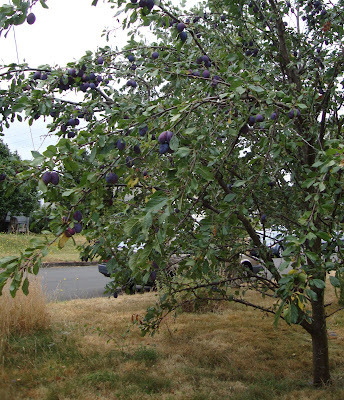 Our plum tree is a favorite of the deer. They never hop our fence, because of the dogs...but when the plums are ripe, all bets are off. It must be like chocolate cake to a deer! There used to be a plum tree down the street. It hung over the sidewalk, and we (and the bears) visited it regularly. I love fresh plums! Sadly they cut it down recently. What beautiful color! It was SO good to see you last night Ms.Danger - sorry again to crash the garden party, but I'm so glad we did! :) Hope to see you again some day soon! Liza, birds! Ah yes....I suppose without the threat of bears the birds would be a problem. Weeping Sore, looking back so am I. Our neighbors did have one fall in their pool though! Mr. S...worse than pears? That's serious talk. I've had pretty good luck - but I certainly know what you mean. Evelyn, isn't the color just fabulous? If I could only reproduce the subtle shading in paint (on a wall). MulchMaid, I want to make a joke about the Dancing Bear (bare) but I guess that isn't in Overlook is it? More of a Kenton institution. ricki, I am so glad you see it too! Wyatt, I count myself lucky that I don't have to deal with deer in my garden. Laura, Yay! You had bears too? A + M, it was just crazy to see you, thanks for crashing the party! And thanks for stopping by and bringing the cutest baby I've ever seen! 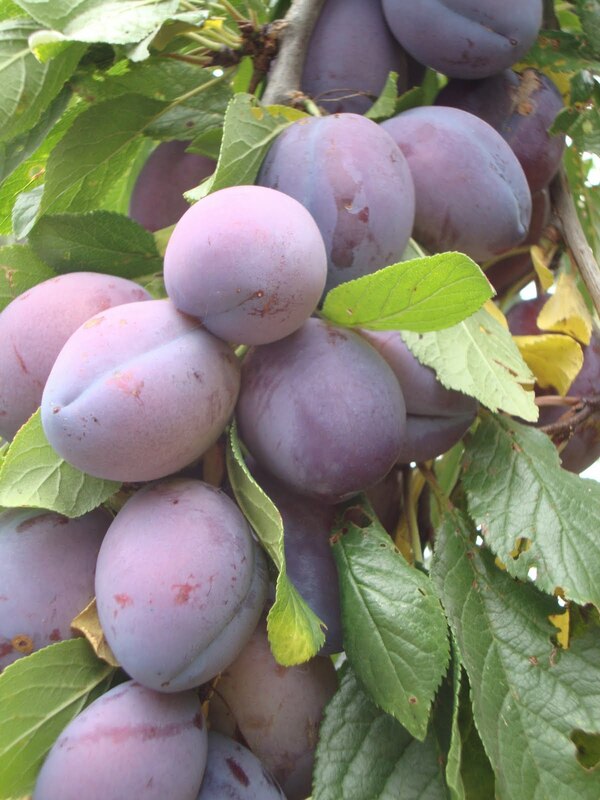 Beautiful plums. We had a tree here with delicious plums but after a horrid and I mean horrid case of aphids I did the deed. We're plum-less now.